Todd Martz doesn’t like compromises, especially when it comes to data collection. Martz, an assistant professor of marine chemistry at the Scripps Institution of Oceanography, wanted the most stable sensors on the market that could hold their calibrations and handle long term deployment in seawater. But no commercial sensor package included all of his ideal parts. So, he and his colleagues built their own, compiling sensors from three competing manufacturers that would likely never collaborate. “My motivation was to collect the best data for research purposes, not market a product,” Martz said. It started when Martz wanted to reliably measure seawater pH. He didn’t want to use common glass bulb pH sensors because their readings tend to drift away from calibration, especially in the ocean. “Glass electrodes work fine on a lab bench, but become problematic when deployed in the ocean for extended periods,” Martz said. Martz was looking for something that required minimal calibration intervals with maximum accuracy. He settled on another electrode-type pH sensor known as an ion selective field effect transistor. The model Martz chose was the Honeywell DuraFET III. The sensor’s construction is very different from traditional glass electrode pH sensors. The DuraFET uses a small computer chip, which senses hydrogen ions when directly submersed in a liquid, according to Vickie Olson, a Honeywell analytical product specialist. It has a much faster response time than glass electrode bulbs and minimal drift. The DuraFET does have limitations. It can only go to depth of 80 meters, making it impossible to profile the full 5,000 meter water column. “The pressure tolerance issue is being addressed now as part of a grant from the National Ocean Partnership Program,” Martz said. Martz and Ken Johnson, a senior scientist at the Monterey Bay Aquarium Research Institute, installed the DuraFET sensor in a waterproof housing with a data logger, creating what they called the SeaFET autonomous monitoring package. The unit, which measures measures pH and temperature, can be mounted on a mooring or anchored to the sea floor. It can last around six months in seawater without calibration. Martz later added an Aanderaa Optode 3835 dissolved oxygen sensor and a Sea-Bird SBE-37 conductivity sensor to the package, dubbing it the SeapHOx. It’s a compilation of sensors from competing brands whose products Martz considers the best he could put together for stable seawater data collection. Martz said determining how to calibrate the sensor package was half the battle of building it. The team at Scripps has a good process, but the calibration is still not as dynamic as Martz would like it to be. He said accounting for variable temperature shifts in the ocean was one of the most difficult tasks of creating a calibration. 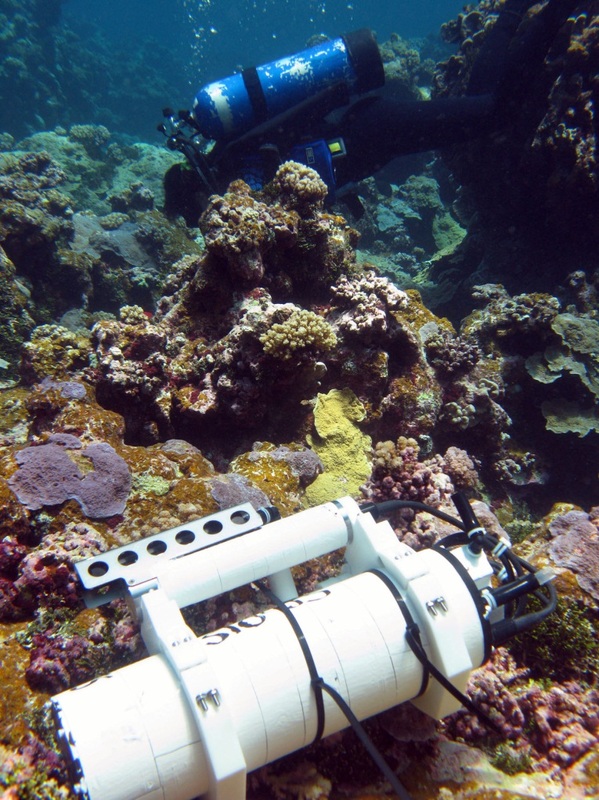 The SeapHOx can be deployed up to a year without calibration. Martz said usually the batteries die or biofouling occurs before the sensors drift out of range. SeaFET has become commercially available through Satlantic Inc. The SeapHOx, on the other hand, can’t be bought from any manufacturer. Martz’s group at Scripps has constructed about 50 SeapHOx units for their collaborators.